A slight departure today from the subjects that I usually paint. Most of what I do are dogs, but I live in an area that also has a lot of horses and from time to time I get a commission to paint one. 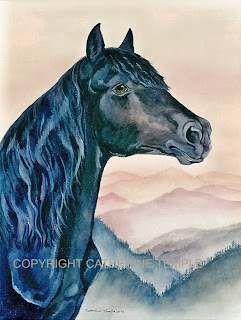 This is a Morgan horse depicted against a setting of misty mountains where he is often ridden on trail rides. There are a lot of awesome wilderness trails near me and you can ride off into the sunset or sunrise and be out and totally alone and be witness to the most spectacular scenery. Sigh! While I can't be out riding a horse into the wilderness right now, I can look at this picture and dream about doing so. Maybe you can, too. Well, I have my business plan written out and my schedule for the year is starting to take shape. My first show will be the Lewiston Spring Cluster Dog Show April 17 - 20, in Lewiston, Id. and I was just notified that I was selected to participate in the Art Under the Elms show this spring also in Lewiston, Id. The show dates are April 24 - 26. It is a part of the annual Dogwood Festival here in the valley and is a big event for our area. These are both good sized shows and coming so quickly one after the other is going to really have me hopping! I have a lot to do between now and then! I need to get started producing new work and implement the ideas that I have outlined in my plan. I have only a few months to do it in and I will still need to be working on my current commissions. So you know where I'll be for the next few months.... in my studio painting away! I'll need a picture like this horse painting that I can look at and dream about because until those first few shows are over I will be sequestered away! Well, time to get to work. Pray for me to be flowing with ideas and the energy to paint them! Blessings until next time!